3کارشناس ارشد برنامه‌ریزی و کنترل پروژه امور تحقیق و توسعه مس منطقه کرمان، رفسنجان، ایران. مقدمه: یکی از هدف­های عمده نظام آموزش و پرورش ایجاد رفتارهای سازگارانه در کودکان است. از جمله راهکارهای پیشنهادی برای تنظیم رفتار، آموزش فلسفه به کودکان می‌باشد. در این راستا، هدف پژوهش حاضر بررسی تأثیر آموزش فلسفه بر رفتار اجتماعی دانش­آموزان پسر پایه‌های پنجم و ششم ابتدایی شهر سرچشمه بوده است. مواد و روش ­ها: طرح پژوهشی به‌صورت نیمه تجربی و از نوع پیش‌آزمون –پس‌آزمون با گروه کنترل بود. بدین منظور، 40 نفر از دانش­آموزان پسر پایه‌های پنجم و ششم ابتدایی شهر سرچشمه بعد از نمونه‌گیری به صورت تصادفی به دو گروه مداخله و کنترل تقسیم شدند .از پرسشنامه رفتار اجتماعی Warden و همکاران Child Social Behavior Scale(CSBS)به عنوان ابزار غربالگری و گردآوری داده‌ها در دو مرحله پیش‌آزمون و پس‌آزمون استفاده شد. برنامه آموزش فلسفه به کودکان به مدت 10جلسه 2ساعته بر روی گروه مداخله اعمال گردید .داده‌ها با استفاده از آزمون تحلیل کوواریانس (ANCOVA) مورد تجزیه و تحلیل قرار گرفتند. یافته‌ها: نتایج نشان داد آموزش فلسفه به کودکان منجر به تفاوت معنی‌دار آماری بین مراحل پیش و پس‌آزمون در نمره کلی رفتار اجتماعی در گروه مداخله شد (001/0>p) به این صورت که در مرحله پس‌آزمون، گروه مداخله نسبت به گروه کنترل رفتار اجتماعی بهتری را گزارش نمودند. نتیجه‌گیری: با توجه به اثربخش بودن استفاده از برنامه آموزش فلسفه به کودکان در بهبود رفتار اجتماعی دانش­آموزان پایه‌های پنجم و ششم ابتدایی، آموزش این برنامه در راستای بهبود رفتار اجتماعی پیشنهاد می‌شود. 1Assistant Prof, Dept of Islamic Philosophy and Theology, Vali-e-Asr University, Rafsanjan, Iran. 2Assistant Prof, Dept of General Courses, Vali-e-Asr University, Rafsanjan, Iran. 3Master of Planning and Control of the Copper Research and Development Project, Kerman, Rafsanjan, Iran. Introduction: From among the major goals of an education system is to create adaptive behaviors in children. Besides, one of the strategies recommended to regulate the children’s behavior is teaching philosophy to them. 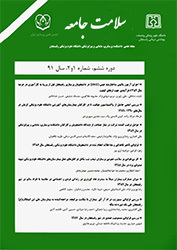 In this respect, this study is conducted aimed at examining the effects of philosophy education on the social behavior of the 5th and 6th-grade male students in the primary schools of Sarcheshmeh City. Materials and Methods: The research design was semi-experimental, with a pretest and a posttest, and a control group. For this purpose, 40 individuals of the 5th and 6th-grade male students in the primary schools of Sarcheshmeh City were randomly assigned into two intervention and control groups by the random name selection, after the whole population was purposefully sampled. The Children’s Social Behavior Scale (CSBS) of Warden et al. was used as the screening tool, and the data collection was conducted in the two pretest and posttest stages. The philosophy education course was run for the children in the intervention group in 10 two-hour sessions. The data were analyzed using ANOVA. Results: The results indicated that philosophy education for the children led to a significant statistical difference between the pretest and posttest stages in terms of the total score of the social behavior in the intervention group (p<0.001). In the posttest, the intervention group reported a better social behavior than the control one. Conclusion: Considering the effectiveness of running philosophy education courses for children in improving the social behavior of the 5th and 6th-grade students, running such courses is recommended to improve the children’s social behavior. McGrew KS, Bruininks RH, Thurlow ML. Relationship between measures of adaptive functioning and community adjustment for adults with mental retardation. Exceptional Children 1992;58(6):517-29. Lipman M. Thinking Children and Education. 1ne ed.Dubuque: Kendall;1993:112-523. Herbert M.Clinical child psychology. social learning developmental and behavior. 2nd ed. New York: Willey;1998:18-20. Gilliam WS, Shahar G. Preschool and child care expulsion and suspension: Rates and predictors in one state. Infants & Young Children 2006;19(3):228-45. Bagwell CL, Molina BS, Pelham Jr WE, Hoza B. Attention-deficit hyperactivity disorder and problems in peer relations: Predictions from childhood to adolescence. JAACAP 2001;40(11):1285-92. Trickey S, Topping KJ. ‘Philosophy for children’: a systematic review. Research papers in Education 2004;19(3):365-80. Warden D, Cheyne B, Christie D, Fitzpatrick H, Reid K. Assessing children's perceptions of prosocial and antisocial peer behaviour. Educational Psychology 2003;23(5):547-67. Farahani MF. The study on challenges of teaching philosophy for children. Procedia-Social and Behavioral Sciences 2014;116:2141-5. Daniel Mf, Auriac E. Philosophy, critical thinking and philosophy for children. Educational Philosophy and Theory 201143(5):415-35. Haynes J, Murris K. The provocation of an epistemological shift in teacher education through philosophy with children. Journal of Philosophy of Education 2011;45(2):285-303.